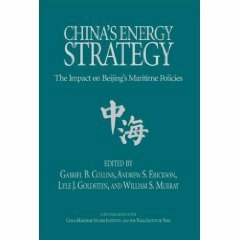 Gabriel B. Collins, Andrew S. Erickson, Lyle J. Goldstein, and William S. Murray, eds., China’s Energy Strategy: The Impact on Beijing’s Maritime Policies (Annapolis, MD: Naval Institute Press, 2008). 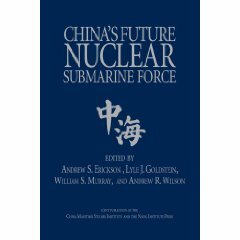 Reprinted in Chinese as [美] 加布里埃尔·B.柯林斯 [Gabriel B. Collins], 安德鲁·S.埃里克森 [Andrew S. Erickson], 莱尔·J.戈尔茨坦 [Lyle J. Goldstein], 威廉·S.默里 [William S. Murray], 编者 [Editors]; 李少彦 [Li Shaoyan], 姜代超 [Jiang Daichao], 薛放 [Xue Fang], 刘宏伟 [Liu Hongwei], 译者 [Translators]; 中国能源战略对海洋政策的影响 [China’s Energy Strategy: The Impact on Beijing’s Maritime Policies], 海洋战略与海洋强国论丛 [Maritime Strategy and Maritime Great Power Forum Series], 十二五国家重点出版物出版规划项目 [Twelfth Five-Year Guideline State Key Publications Planning Initiative] (Beijing: 海洋出版社 [Ocean Press], 2015). Authorized Chinese-language edition published in 2015 by China Ocean Press (oceanpress.com.cn). 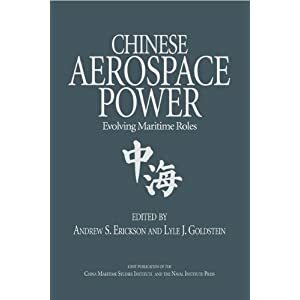 and, with Lyle J. Goldstein and Gabriel B. Collins, of “Chinese Naval Analysts Consider the Energy Question,” 299-335 (中国海军分析家关注的能源问题). SAMPLE CHAPTER: Dan Blumenthal, “Concerns with Respect to China’s Energy Policy,” 418-36. China’s rapid growth has prompted Beijing to undertake an aggressive search for resources on a truly global scale. The resource most directly tied to continued growth in China is energy. Rising consumer appetites in China, coupled with occasional rolling blackouts due to spiraling demand in Chinese cities, have prompted intense anxieties in China concerning energy security. Since 80 percent of Chinese fossil fuel imports pass by ship through the Malacca Strait, an important component of Beijing’s concerns have come to be known in China as the “Malacca Dilemma.” This book draws on America’s finest experts in the fields of economics, energy, China studies, and naval strategy in order to explore China’s “Malacca Dilemma” and its implications for global maritime security. The essays in this volume draw from a wide variety of viewpoints, but a central theme of the analyses is that the United States needs to be concerned that China is drawing upon much of the world’s remaining oil reserves for its exclusive use. The resulting competition for this diminishing resource could lead to energy insecurity and may support other tendencies toward rivalry that in turn could foster a naval arms race neither side seeks. One of the major conclusions of this study is that there is, in fact, ample room for Sino-American energy dialogue and cooperation in the maritime domain and that the competition for limited energy sources like oil need not lead to conflict. The book’s authors are all authorities in their fields; many of the contributors are frequent advisers to major oil, shipping, and other multinational corporations, as well as governments. As a result, this volume takes into account an unprecedented range of influences and factors befitting such an important and complicated topic. 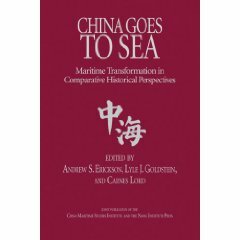 This is the second book in the series “Studies in Chinese Maritime Development” published jointly by the China Maritime Studies Institute and the Naval Institute Press. —James Caley, review on Amazon.com, 24 October 2017. —Richard Desjardins (Canadian civil servant), Joint Force Quarterly 57.2 (2010): 132-33. —Scott W. Bray (the U.S. Navy’s Senior Intelligence Officer for China), “Turning to the Sea… This Time to Stay,” Book Review Essay, Asia Policy 9 (January 2010): 167-72. —Ships & Shipping (July 2009): 38. —Arthur Waldron, Pacific Affairs 82.2 (Summer 2009): 328-30. —Yevgeny Petelin, “Energy at the Edge of War and Peace,” Security Index 87.15 (Spring 2009): 147-49. —Andrew Forbes, International Journal of Maritime History (December 2008): 478-79. —David N. Griffiths, Canadian Naval Review 4.3 (Fall 2008): 42-43. —Wolfgang Legien, Editor-in-Chief, Naval Forces; former Director of Politico-Military Affairs, Supreme Allied Commander Atlantic, Naval Forces: The International Forum for Maritime Power 29.4 (April 2008): 146. [美] 加布里埃尔·B.柯林斯 [Gabriel B. Collins], 安德鲁·S.埃里克森 [Andrew S. Erickson], 莱尔·J.戈尔茨坦 [Lyle J. Goldstein], 威廉·S.默里 [William S. Murray], 编者[Editors]; 李少彦 [Li Shaoyan], 姜代超 [Jiang Daichao], 薛放 [Xue Fang], 刘宏伟 [Liu Hongwei], 译者 [Translators]; 中国能源战略对海洋政策的影响 [China’s Energy Strategy: The Impact on Beijing’s Maritime Policies], 海洋战略与海洋强国论丛 [Maritime Strategy and Maritime Great Power Forum Series], 十二五国家重点出版物出版规划项目 [Twelfth Five-Year Guideline State Key Publications Planning Initiative] (Beijing: 海洋出版社 [Ocean Press], 2015). Click here to purchase via Amazon.cn. Click here to purchase via Dang Dang.